Even though it was counted among the nineteen boats sunk or wrecked during the Great Storm of 1913, the Howard M. Hanna Jr. and her crew of twenty-five turned out to be survivors. Capt. Hager and his chief engineer Mayberry later told how the seas, stirred by seventy-mile-per-hour winds, swept the four hundred eighty-foot steel vessel with such force they carried away part of the aft cabin, smashed windows and tore the roof from the pilothouse. The seas continually lifted the rudder and propeller out of the water, putting the boat out of control. When the Hanna fell in the trough of the seas and her engines lacked the power to swing the bow into the wind again, it wasn’t long before the storm drove the vessel onto the rocks near Port Austin, Michigan. Newberry said he had the engines turning at full speed, trying to help the captain keep the boat turned into the teeth of the gale. He said the pumps also were running full blast as sailors battled to get the water out of the hold as fast as it was coming in. "Everything went well until about 6:30 (in the evening). Then the oiler’s door was smashed in on the starboard side, and the two engine room doors failed followed by the port-hole glass. By then Mayberry said the water will rushing into the engine room. Things got worse. Mayberry said the force of the storm swept the cabin area housing the kitchen and mess hall completely off the stern deck. Part of the woodwork came crashing down the open doorway into the engine room. "The water kept coming until we went on the beach." That was at about ten o’clock. By then the cabins were smashed and the stack had toppled. Later even the hull cracked, cutting electric power and communications between the engine room and the pilot house in the bow. Crew members were trapped for several hours at the two ends of the wreck, without a way to talk to each other or keep warm. It was the ship’s cook, a remarkable woman identified as Mrs. Clarence Black of Chicago, who kept morale up during the long hours that followed. The sailors said she was in water up to her waist; standing exposed to the storm, but kept a fire going in the galley stove in her wrecked kitchen so that hot coffee could be served. She kept the coffee on from Sunday night until Tuesday morning when lifesavers at last reached the wreck. Black was later hospitalized in Port Huron for treatment of exposure and exhaustion. The crew took up a collection on her behalf. They said Black was a frail woman who weighed no more than a hundred pounds, and was her making her final trip on the lakes before retiring. 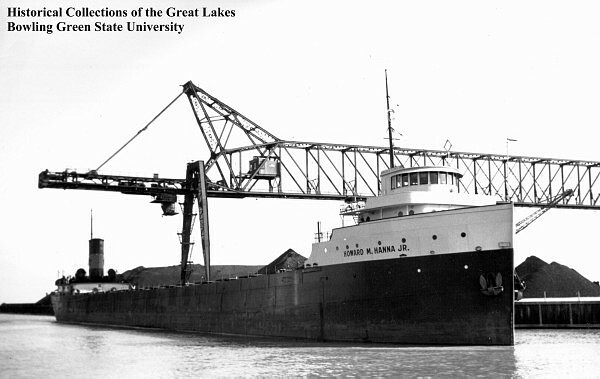 The Hanna was on its way from Lorain, Ohio, to Ford William, Ontario, with nineteen hundred tons of soft coal when the storm caught it in the middle of Lake Huron, off Pointe aux Barques. The boat later was salvaged, rebuilt and returned to service under the Canadian flag. It also had a new name, Glenshee. The vessel remained on the lakes operating under the names Marquette, Goderich and Agawa, and finally as a grain storage barge under the name Lionel Parsens until 1983, when it was scrapped at Thunder Bay, Ontario.